Table booking is possible from 4 hours to 20 days in advance. Click on the calendar blank and choose a date. Select the time. With arrows you can scroll the times. Monday to Friday from 12:00 to 19:00, Saturday 11: 00-20: 00 and Sunday 11: 00-19: 00. We are open for longer at special events. See information on our FB page. Select a vacant table(green) from the tables picture. Taken table is in red. Maximum amount of people in one table is 6. Click "Book a table" button. Check if your personal information is correct and if necessary, change the amount of people. Fill out the form with your contact details. When you're ready, click "confirm". Warning !! Reservation confirmation takes time. Be patient and wait. Do not do same reservation again. 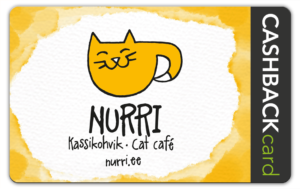 In order to take care of our cafe cats, we will add an additional fee to your order to support the kitties. 5€ for adult and 2,5€ for pensioner/student. Kids up to 19 years are free. Family (2 adults + 1-4 kids) is in total 10€. NB! The table will be held booked for 20 minutes. If you plan on coming with a bigger delay, write it down in the comments of the reservation form. IMPORTANT! Our cafe is the home for our 10 friendly young kitties. They are the residents and all of us are the guests, so let's behave as a guest. Fee for using the cafeteria for three hours 190.-. No additional fees. However, it does not include meals or drinks. Maximum size of the group is 50 people incl. children. The parents of pre-school children are particularly responsible for the fact that their child does not violate our cafe rules towards cats. The card is for FREE. It will return 4% of each purchase back and points of purchase from 20-40% of the cost range. In addition to us the card is valid in more than 500 Estonian companies. Later you will receive 1-5% of the money back and 0,5-35% on the points of purchase. The returns we receive are non-restricted and cashable in other partner companies. 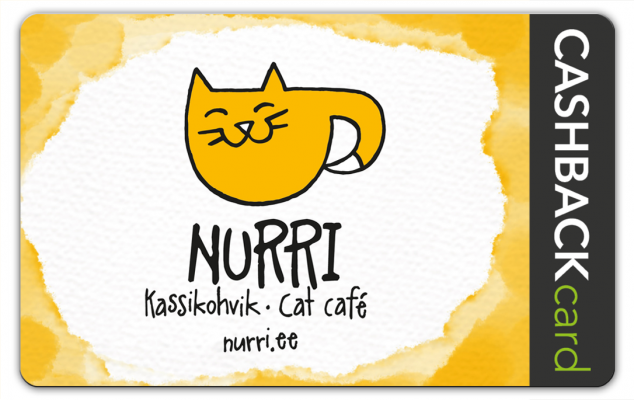 To receive the card, click the link to Nurri CBCard registration and fill in the required fields. The card is attainable in the cafe.